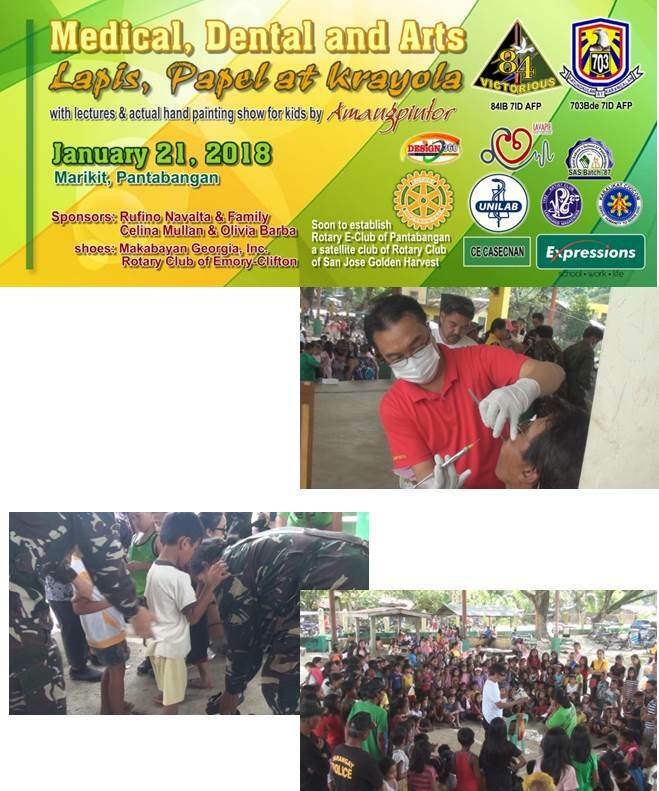 January 21, 2018 - known folk artist Elito Circa aka Amangpintor the chairman of Samahang Makasining (Artist Club), Inc. and president of the Rotary Club of San Jose Golden Harvest organized a public services on Medical, Dental and Art with the support of co-rotarians and other donors together with 84IB AFP and 703rd Agila Brigade 7 Infantry Division of AFP. The activity was able to cater 300 individuals for Medical Services, 120 for Dental Services, 60 for Haircut, 250 for Shoe Repair and 300 plus kids for the Gift Giving Activity. Amangpintor also shared his talent through actual hand painting demonstration for almost 300 kids and contributed pencils, erasers and crayons as part of his advocacy "Lapis, Papel at Krayola (ALPK)".